Do you love hummus and want a quick and easy dinner? 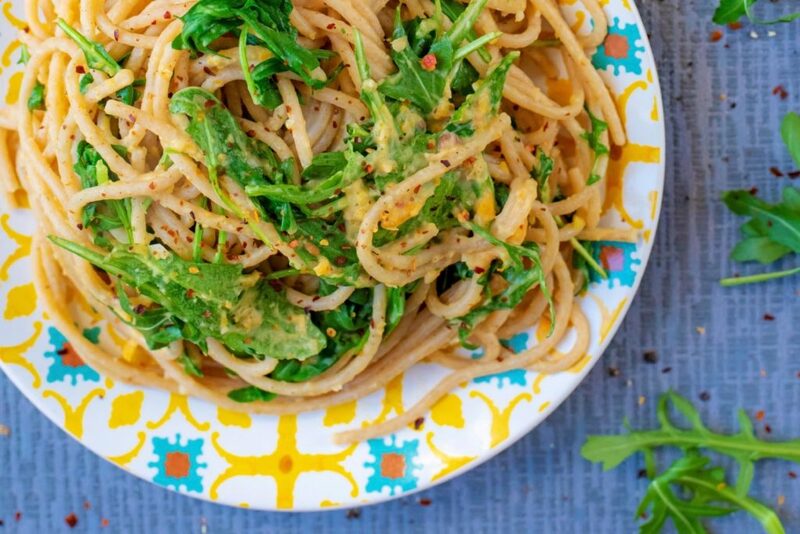 This Creamy Butternut Squash Hummus Pasta is for you! 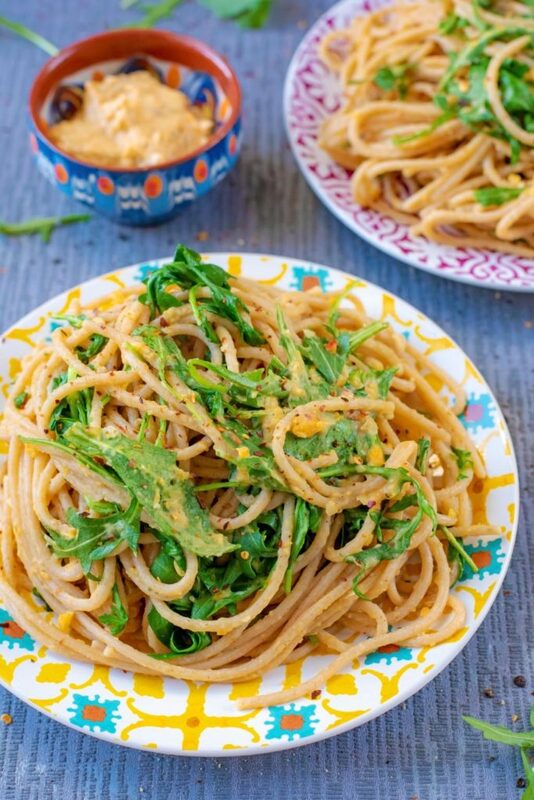 Make a batch of our Roasted Butternut Squash Hummus and then use some of the leftovers to stir in to pasta with some greens for a healthy meal under 15 minutes. Trust me on this one – hummus makes an incredible pasta sauce. Dipping some pita bread in hummus is always a classic way to eat it, but there is so much more that you can do with hummus, like using it in this Creamy Butternut Squash Hummus Pasta. It’s creamy, protein packed and not to mention cheap to make, which is why it makes a great pasta sauce. If you have never tried it with pasta, then you are missing out. 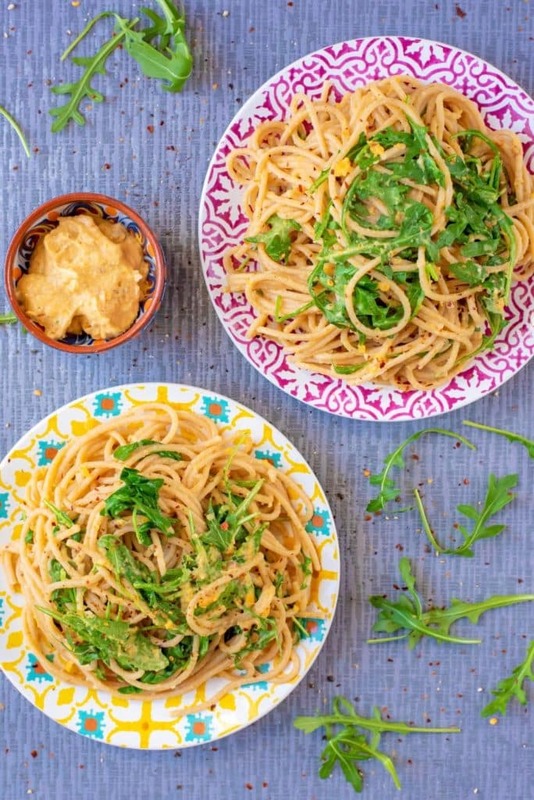 Do you want to be kept up to date on more delicious recipes like this Creamy Butternut Squash Hummus Pasta? Please subscribe to the blog mailing list (it takes 30 seconds). You will get sent the new recipes straight to your inbox. Your email address won’t be passed on to anyone and you will never be spammed. This is just a quick post for you all today, as there really isn’t much that needs saying about this recipe apart from it’s amazing and couldn’t be any easier. You can use any hummus you like, but to keep this a super budget friendly meal then always go with homemade. 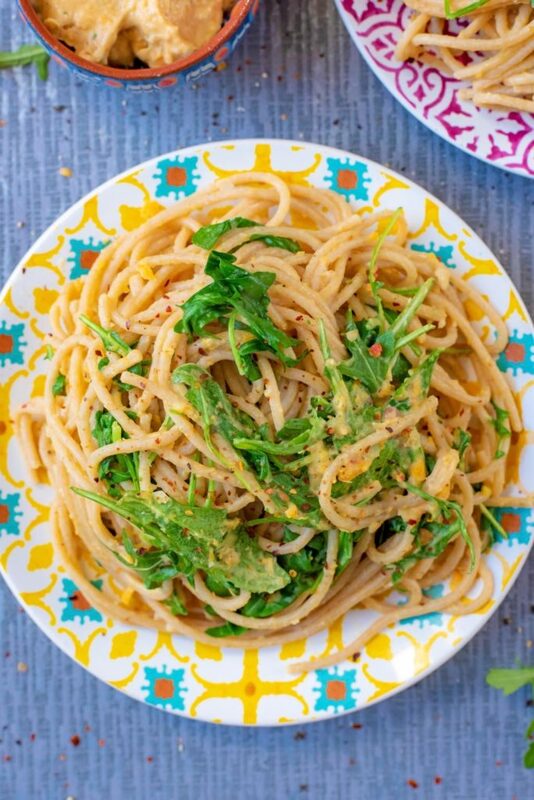 This spaghetti dish is vegan, has just 3 ingredients and ready in under 15 minutes. That’s my kind of meal! We used our Roasted Butternut Squash Hummus, as it adds a hidden vegetable portion to the pasta and a little bit of extra colour too. For more colour, we stirred in some rocket (arugula) which gave it a nice peppery kick too. Then some chilli flakes went on top to finish it, obviously. We are saving up all our spare pennies to do as much travelling this year as possible, so the first thing we are cutting back on is our food budget. Our cupboards are literally bursting with food like pasta and tinned beans, so putting them together was the first step to a budget meal. We usually just stir beans in to spaghetti with some olive oil, lemon juice, garlic and diced tomatoes, but we decided to turn the beans in to a sauce once and as it was basically hummus, it was a natural progression to stir actual hummus in to pasta. Life changing. 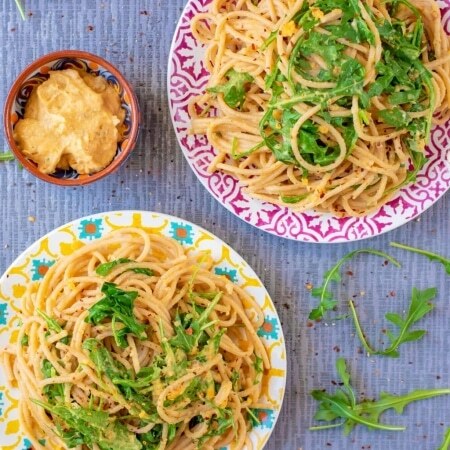 Make a batch of our Roasted Butternut Squash Hummus and then use some of the leftovers to stir in to pasta with some greens for a healthy meal under 15 minutes. Drain and put back in the pan and stir in the hummus and rocket. Serve in bowls and sprinkle on the chilli flakes if using. yammmiii…. this veg noodles is too good in looking …i wish i will make try this at home. Butternut squash hummus is a favourite of mine to make. I bet it’s lovely on pasta too. Yummm Yummm. looks really yummy. I will try it as this recipe seems really easy to cook. Thanks for sharing. This is brilliant! I’m always looking for new ways to use butternut squash. What a wonderful idea, I actually have some frozen butternut in my freezer. Guess what I’m making! I love butternut squash and I love hummus, so this sounds like the perfect meal pairing to me! Yum! What a clever recipe! A friend of ours makes a really delicious spicy butternut squash hummus that would be perfect with pasta, I’d just never thought of putting the two together. Must try! This dish sounds so good! I love that you added the amazing sounding hummus to pasta! My family will love this recipe. I am going to put it on my list to try! This is genius Dannii! I love that you try so hard not to waste anything. It breaks my heart every time we have to throw food away, so any other recipes like this you have, to reduce food waste would be great! I am always looking for different ways to eat hummus. I usually just have it with some cucumber sticks, but that does get a bit boring. Do you think this would work with courgetti too? This is such a great idea. Next time I have leftover hummus, which doesn’t happen very often, I am going to make this. Great idea to use hummus with pasta – I have to admit we tend to forget about other ways of using hummus and end up in the dipping pita bread in! I love that you are going on so many travels while little Avery is so young. This pasta looks so fresh and delicious! Perfect for the summer weather!! 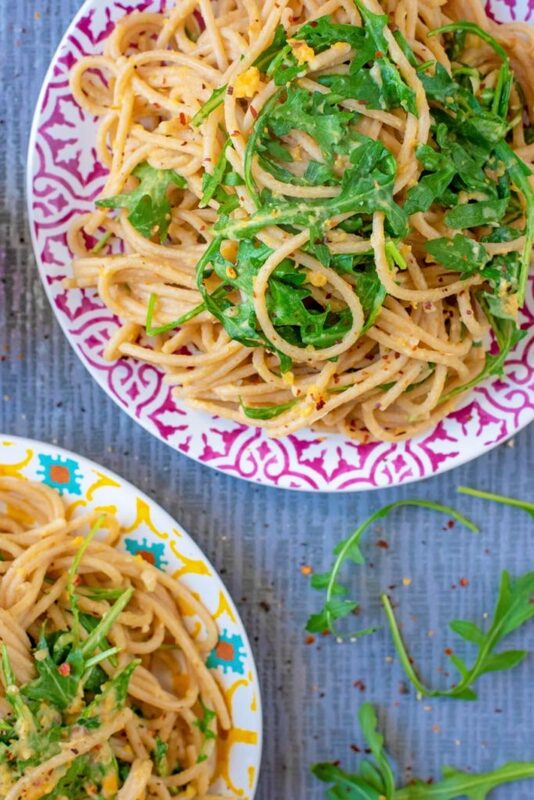 this pasta sounds so easy to make and still so delicious! Oh wow, a real hybrid of 2 cuisines here. I guess hummus goes with any carbs! Look forward to trying this and seeing if I agree with you! What a delicious looking pasta dish! 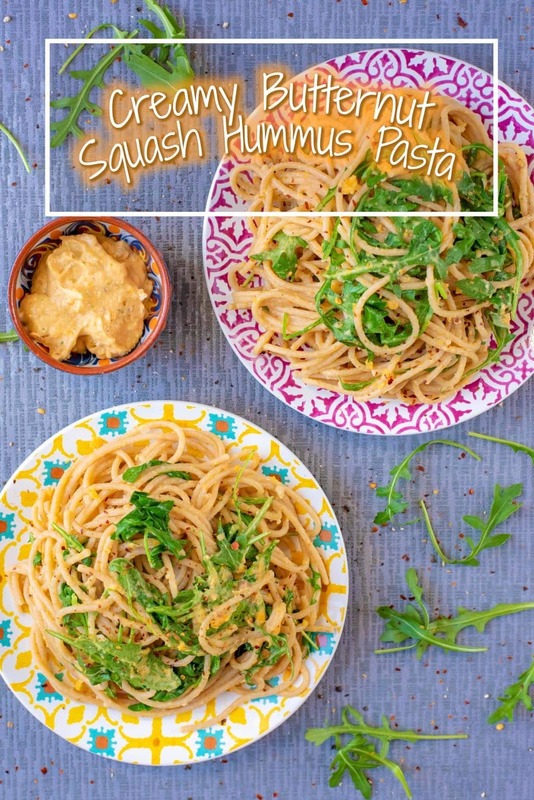 I have never thought to use hummus in pasta and I’ve been meaning to try your roasted butternut squash hummus so will definitely have to give this dish a try!